This spacecraft booster was launched from Cape Canaveral in what was known as a Project Mercury test. In this historical photo from the U.S. space agency, this Project Mercury test on Feb. 21, 1961, a spacecraft booster by a modified Atlas, was launched from Cape Canaveral, Florida. The Mercury capsule reached a peak altitude of 107 statute miles and landed 1.425 miles down range. Atlas was designed to launch payloads into low Earth orbit, geosynchronous transfer orbit or geosynchronous orbit. 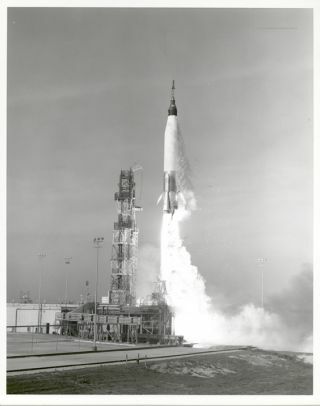 NASA first launched Atlas as a space launch vehicle in 1958. Project SCORE, the first communications satellite that transmitted President Eisenhower's pre-recorded Christmas speech around the world, was launched on an Atlas. For all three robotic lunar exploration programs, Atlas was used. Atlas/ Centaur vehicles launched both Mariner and Pioneer planetary probes. The current operational Atlas II family has a 100% mission success rating. For more information about Atlas, please see Chapter 2 in Roger Launius and Dennis Jenkins' book To Reach the High Frontier published by The University Press of Kentucky in 2002 (in which Dennis Jenkins notes on page 98 that "as a space launch vehicle there is no question that Atlas has made a mark for itself, and a great deal of money for its manufacturers").